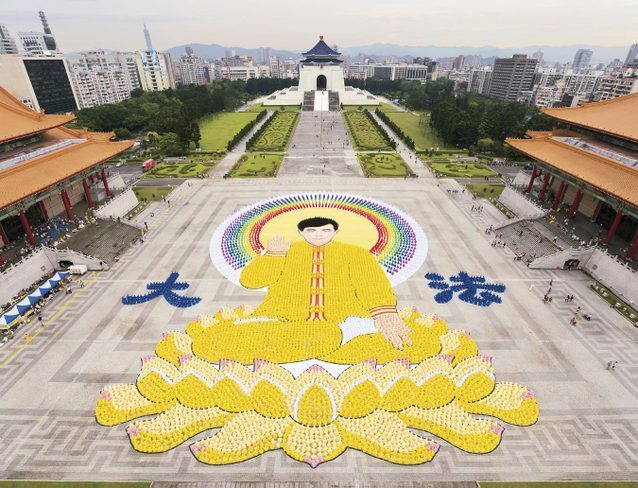 On April 29, 2012, more than 7,000 Falun Gong practitioners assembled at Freedom Square in Taipei to form a spectacular image of Master Li Hongzhi, the founder of Falun Gong. 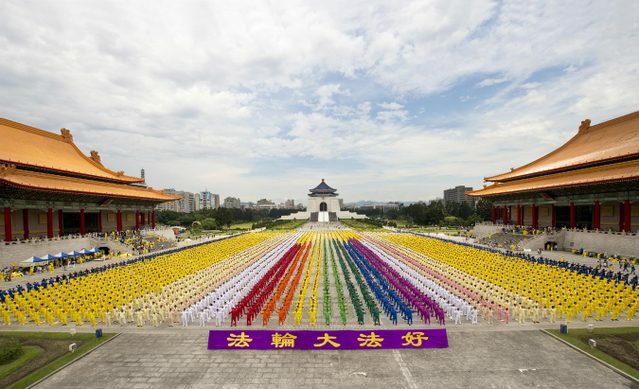 They were celebrating World Falun Dafa Day—upcoming on May 13— the twentieth anniversary of Falun Dafa's public introduction. The grand scene attracted the attention of tourists from around the world, who stopped to watch and take photos. At Taipei's Freedom Square, 7400 Falun Gong practitioners form the image of Master Li Hongzhi, the founder of Falun Gong—a grand spectacle. 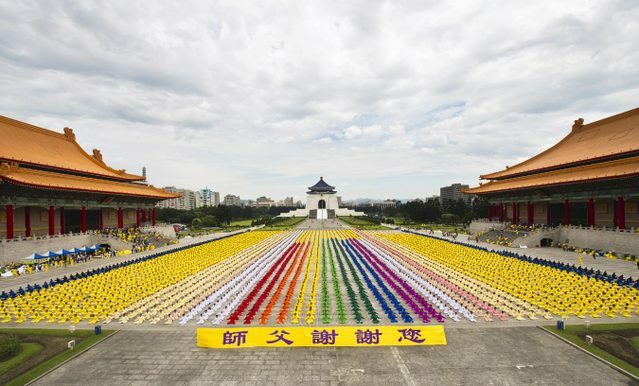 More than 7,000 Falun Gong practitioners doing the exercises in a large group. Ms. Huang Chunmei, vice chairman of the Taiwan Falun Dafa Association, said that during preparations for the formation three days earlier, Chinese tourists arrived in buses, one after another. They were very surprised, and many asked what was happening. Practitioners spoke with them about Falun Gong and the persecution, and the photo displays in front of the square were often surrounded by many tourists. Some Chinese tourists who had been misled by the Chinese Communist Party's lies and slander of Falun Gong, failed to understand and kept asking, “Is it legal?” “Have you been approved?” “Falun Gong can do this in Taiwan?” More Chinese tourists were amazed at the spectacular scene, and stood on the outer rim watching for a long time. Many took pictures to record the precious scene to show their family members and friends after they returned home. Practitioner Mr. Wu Qingxiang, who was in charge of the design of the formation, said that they met a great challenge this time, because it rained for three consecutive days. The guidelines made on the ground had repeatedly been washed away by the rain. Time was very tight, but practitioners accelerated the work despite the rain and wind. Mr. Wu felt the cultivators' perseverance, and their unceasing and continuous efforts to clarify the facts and save people. The one-hour formation was peaceful and orderly, and several practitioners shared their feelings afterward. They felt it miraculous that during the formation, it rained for 20 minutes. They could hear the rain dropping, but they felt the rain dropping only beside them; there was no rain falling on their bodies. Looking around, they found that other practitioners also were only a little wet. 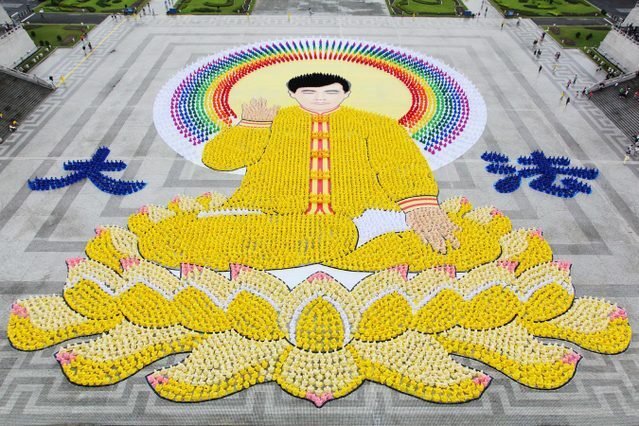 After forming the image, accompanied by peaceful exercise music, the practitioners gently closed their eyes, and maintained serene expressions on their faces. They followed Master's voice, and did the five sets of exercises. Many citizens sitting outside the National Concert Hall and National Theatre on both sides of the square quietly watched the practitioners' one-hour group practice. Some people with predestined relationship joined in.